To go to the chronologies just click on the region of interest or use the text link. This web site gives the chronologies, from approximately 1945 onwards, of countries in which the US and UK governments have intervened, since 1945. It is important to emphasize that the actions here are those of the US and UK governments and not the people of the US and UK. The people in many cases don't know what has been done in their names and very seldom know the true reasons for these actions. This web site is an attempt to provide information which is not widely known in the US and UK, in order that such interventions can be prevented in the future. Is the information presented here objective? The author's opinion is that many actions of the US and UK governments are not taken for the reasons they state and that those actions are harmful to many people. The information presented here helped the author in arriving at this opinion. It is recommended that you examine the information, check its authenticity, weigh it against opposing evidence and draw your own conclusions. 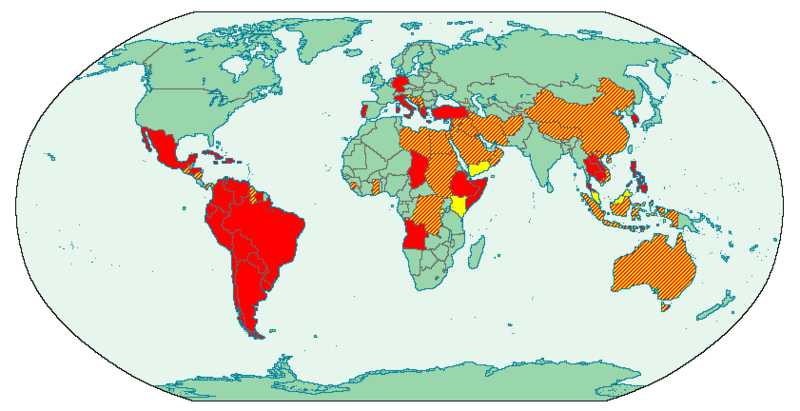 US interventions: Albania, Angola, Argentina, Bolivia, Brazil, Cambodia, Chad, Chile, Colombia, Dominican Republic, Ecuador, El Salvador, Ethiopia, Germany, Honduras, Jamaica, Korea, Laos, Marshal Islands, Peru, Paraguay, Portugal, Puerto Rico, Somalia, Suriname, Thailand, Uruguay, Venezuela. Write to those in the media, MediaLens is useful here. Feedback is welcomed. In particular please let me know of any innaccuracies or omissions. When doing so please cite references. Please e-mail to: admin_at_us-uk-interventions.org replacing _at_ with @.